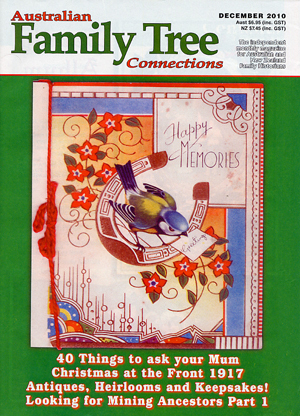 The December 2010 issue of the Australian Family Tree Connections magazine is out now. This issue contains an interesting mix of articles for when a quiet moment presents itself during the busy Festive Season. Do you know anything about a Mary Randall who may have come from Mittagong? and do you have a Bernard McCann on your family tree? The Antiques, Haeirlooms and Keepsakes article makes for fascinating reading, and I guarantee that Grandma’s Wash Day will make you glad you are alive today! The Getting Started section has Part 1 of the new series Looking for Mining Ancestors. Dayboro District Historical Society feature as the guest society in this issue, and websites listed in the Computers and Genealogy section include mailing lists, Australian gateway sites, Australian military, Gravestones, Google Books and WorldCat. Issued monthly this magazine is on sale at newsagents, and family history societies around Australia (price Aus $6.95, and price NZ $7.45). 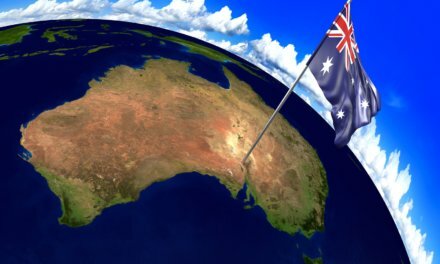 New Zealand and overseas readers can buy this month’s magazine directly from Australian Family Tree Connections. Subcriptions and back issue can also be purchased directly through AFTC.